In the import dialogue in Lightroom 3 on Windows the drive letters A: and B: does not show up. 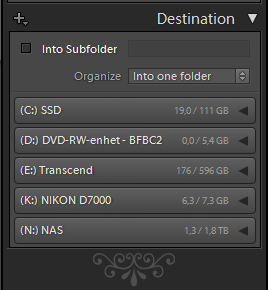 I have A: assigned to an HDD and B: assigned to an SSD where I like to save my DNG files. (It was a VERY long time ago since those drive letters were reserved for floppy drives). My suggestion is to make all drive letters assigned to an attached storage device visible as a destination in the import dialogue. I'm amused by the multitude of posts of people who have the same problem. I'm certain all the things I want to complaining about on this issue have already been said so I'll just add my 2 cents and vote that Adobe recognize this idiotic limitation and remove it. I will say A and B have never been reserved by Windows. It's just that they were often used by people as a legacy thing as we had FDDs before HDDs. In Windows 3.1 I had my OS HDD "A" and my 3.5" floppy "B". Windows was happy with it but many of my software vendor's programmers were idiots and assumed they would be installing and working on the C drive. Also it's quite simple to detect what kind of drive it is. I mean what if I had a floppy drive on Z? Wow, is it possible that we face the issue after so many years? Yes, it is. Added my vote, I find it utterly stupid that Adobe can't just add this, why even filter the drives out? If a drive is mounted, show it. It is possible that Adobe will never change this while Microsoft continue to 'Hard-wire' the A & B drives as 'protected' drives in the Windows operating system. It's been possible to assign A and B to any drive since at least Windows XP. Nothing in the Windows API prevents LR from determining if there's a drive assigned to A and B.
I just added a couple of massive (by today's standards) 8TB drives and assigned them A:\ and B:\ for all my glorious photo-storing and editing needs. Alas, Lightroom is still broken as far as this goes. NOBODY USES FLOPPY DRIVES ANY MORE. FEW PEOPLE EVEN USE CDS OR DVDS ANY MORE. UPDATE THE DRIVE LIST ON IMPORT FUNCTIONALITY!